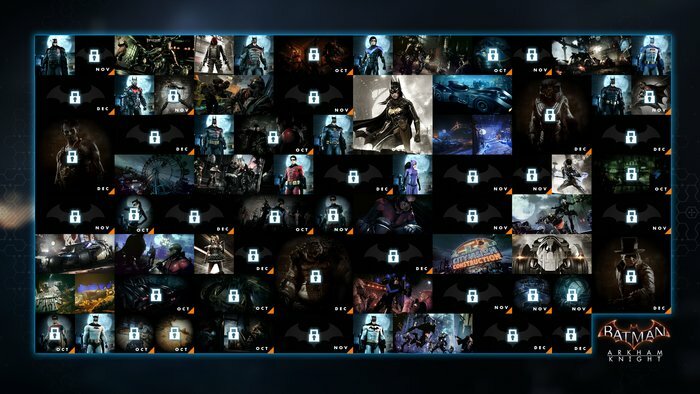 Rocksteady Studios has provided a roundup of the remaining Batman: Arkham Knight Season Pass content, as well as new features and content for all users. The two remaining story-based DLC, Catwoman’s Revenge and A Flip of a Coin, have both been pushed back to a November release, both of which will feature one story missions and 2 AR challenge maps. The remaining DLC includes various skins, AR challenges, and race tracks planned to be released up until December 2015. The free updates Rocksteady has planned for all users includes character selection in AR Combat and Invisible Predator Challenges, and the option to play on Hard difficulty in AR Combat and Batmobile Combat Challenges. Or, wait till the GOTY edition on steam for $20. Which is my plan. My plan as well. That or I might just get it used for the XB1 and skip the DLC. At the rate it's going with the patch(es) that's probably what we'll get when they finally turn pc sales back on. Game has been more than worth it without any of the lackluster expansions. Would be pretty hilarious for them to name the PC version "Game of the Year"
The December stuff sounds pretty cool, I could see myself grabbing that eventually. I'm playing through it right now on PC finally and so far its running great, I get FPS drops but that's my own fault for pushing my 780GTX a little to much. most of it is skins, AR challenges and races. I get the appeal of AR challenges but imo i hate them and the races. skins are worthless. i am interested in the story DLC. Very cool, yeah I enjoyed what I played as well its a rad Batman game for sure. The value depends on the length of the missions. The stuff for Dec looks pretty good if we're talking at least a couple of hours of gameplay per mission. Any word on PC releases of this stuff? Figures the first season pass I ever buy would be unusable for half a year. The season pass was an epic fail. All that stuff is mostly skins. Crap. Story DLC is whats up and those are pure monkey ballz, nothing substantial. The base game was decent at best, so its hard to make fantastic simply based on DLC. But this was a bad way to go out Rocksteady. Learn your lesson.